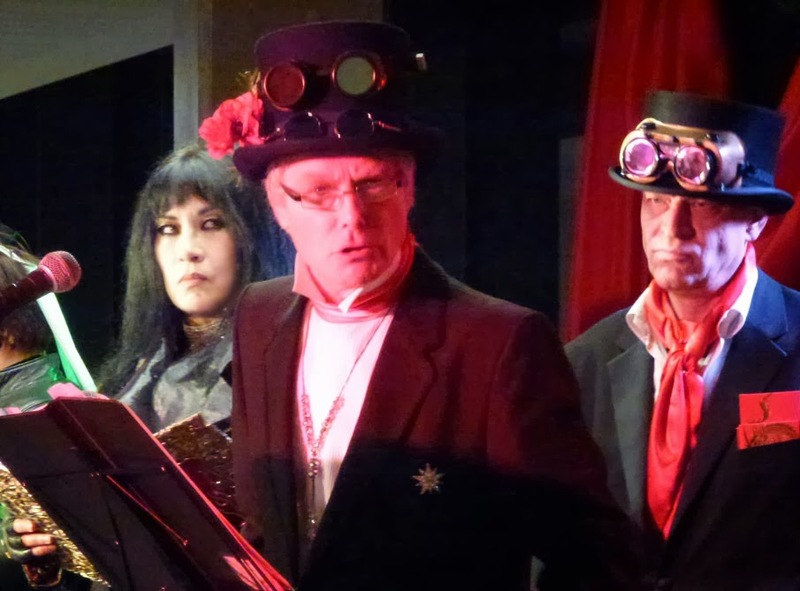 The Steampunk Opium Wars at Anna's arts website. VIDEO: Sir Jardine-Matheson "The Case for Free Trade"
In The Steampunk Opium Wars, poet Anna Chen brings you a satirical extravaganza about China, Britain, imperialism and drugs in the 19th century in verse & music. See narco-capitalists & Chinese lawmakers slug it out, take part in a poetry slam, and watch the weirdest tea ceremony ever. What do the humble cup of tea and the opium poppy have in common? A dastardly tale of imperialism, drugs and warfare, the story of this dark episode in British history is told in The Steampunk Opium Wars, revue written and hosted by Anna Chen inside the belly of the beast, the heart of Empire, the Royal National Maritime Museum in Greenwich. Government narco-capitalists and Chinese law-enforcers slug it out in verse, and members of the audience have the chance to write and take part in a Farrago Poetry History Slam. With music from legendary writer Charles Shaar Murray and The Plague's Marc "The Exorcist" Jefferies; former Flying Lizards singer Deborah Evans-Stickland singing her mega-hit "Money"; DJ Zoe "Lucky Cat" Baxter of Resonance FM; and Gary Lammin of The Bermondsey Joyriders in the weirdest tea ceremony you've ever seen. Featuring Paul Anderson, John Crow Constable, Neil Hornick, John Paul O'Neill, Hugo Trebels, and Louise Whittle. See the poets' portraits and poetic extravagances posted at their own page here. Have your photograph taken in your finest steampunk paraphernalia on stage by Mrs Sukey Parnell, who has exhibited in the National Portrait Gallery, and maybe see it displayed on the interwebz. Come and play with us. The Opium War by Julia Lovell (Picador). Interesting online articles by Justin Kiersky at the Border Arts Project, a Chinese health and education project helping young people whose families have been affected by drug abuse and HIV/Aids. This stuff is still going on. Drugs money saved banks in global crisis in 2007. Banks and drugs in the modern world.